Heater Holder - Sterling Silver Discounts Apply ! For the Cigar Smoking Golfer who has everything!!!!! Treat your favorite cigars in high fashion! Solid sterling body, chain and clasp will hold your premium cigar in the manner in which it deserves. 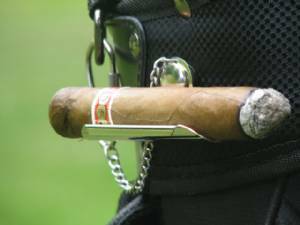 This HeaterHolder is as a much a piece of jewelry, as a great way to hold your cigar. 3" in length with a 4" safety chain and a jewelry-style clasp. This solid sterling silver cigar holder has an attractive beaded front edge, and holds up to a 54 ring cigar in style! Polished to a beautiful shine, this cigar holder is very sharp.